> Complete disassembly and cleaning of components. > Painting services if required using industrial epoxy coating. > Way bar replacement and alignment. > We can supply new frame rails to replace worn or damaged rails as well as new rails for extending a frame for machine changes. > New wiring & cable carriers. > New bearings, belts, pulleys, and shafting as needed. > Sensors can be inspected and components replaced as required. > AIS builds our own detector amplifiers as well as ION chamber assemblies that will fit in most types of OEM sensors. 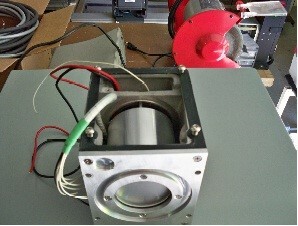 This can replace failed or hard to find ION chambers such as Ohmart, NDC and LFE brands. AIS provides many other options and these can be realized once we have evaluated your system. Below is one example of the many refurbishments that we have completed. At left is an Ohmart OD-150 frame that had damaged frame rails. AIS replaced these rails and repainted the rest of the components to match. 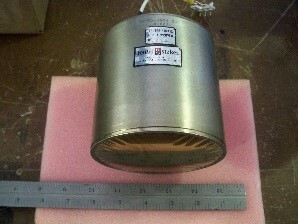 Frame on the right is the end result and includes our advanced ATLAS x-ray sensor that replaced an Am-241 isotope sensor. At left is the original ION chamber from an LFE detector head. This part is no longer made and was replaced with the AIS detector retrofit shown on the right. The detector electronics were replaced with an AIS amplifier and power-supply module as part of an upgrade package.